This 3-part series will discuss the myriad ingredients that are utilized in moisturizer formulas. It will describe the ways in which formulas can be engineered to create specific, desired outcomes, and debunk some of the long-standing myths that have pervaded the industry. This understanding is crucial for those who are recommending products to consumers or patients. Moisturizers provide significant benefit in dermatology – as adjuvant therapy for many clinical conditions, as a key player in anti-aging regimens, and as a core component in maintaining healthy skin barrier function. Although they have been a mainstay for decades, lo­tions and creams are no longer formulated with a one-size-fits-all approach, where thickness was the primary cue for efficacy. In fact, moisturizer design today has become an art as well as a science. Product efficacy, aesthetics, and packaging are all engineered in a variety of ways, to create an expansive market of products that meet many consumer needs. The addition of specific types of functional ingredients can make a noteworthy difference as well. This article will explore the myriad approaches for moisturizer development and debunk some of the long-standing myths that have pervaded the marketplace. In today’s market, with an explosion of product formats and new scientific techniques for combining ingredients with novel packaging, efficacy, the way a product feels, and what it can deliver to skin can be manipulated in a variety of ways. For example, through the careful selection of emulsifiers, polymers, or thickeners, moisturizer consistency is easily transformed to be thinner or more viscous. With the inclusion of key actives in combination with other moisturizing ingredients, efficacy can be dialed up or down. It should also be noted that price may not be indicative of the degree of effectiveness. Our own internal studies have shown that the clinical efficacy of $100 creams is parity to or even inferior to mass market products containing similar ingredients. Price is most often set by the brand appeal and consumer willingness to pay, rather than the efficacy of the product. Differentiating between moisturizers starts with understanding the key components, which can be found on the ingredient label. This label lists the ingredients, by INCI (International Nomenclature Cosmetic Ingredient), in the order of percentage inclusion in the formulation (in most markets). An exception to this rule is that in the US, for ingredients whose inclusion levels are less than 1%, the INCI can be listed in any order irrespective of its actual inclusion level. Figure 1 shows the ingredient lists of a standard body lotion and a high oil body cream. Whereas deciphering the ingredient levels from an INCI is not easy, insights into a formula can be gained by understanding certain principles that apply to all moisturizers. 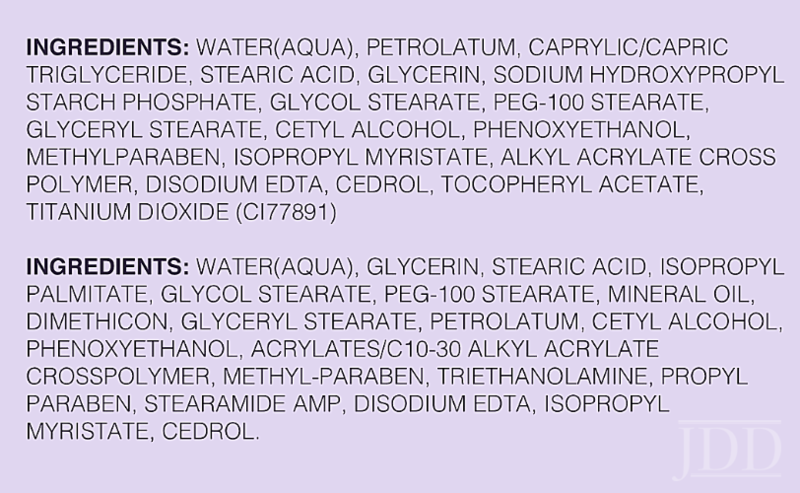 First, in both lotions and creams, water is often the first ingredient. Typically, a lotion contains more water-soluble moisturizers, which are typically humectants. In a cream, occlusives and emollients tend to be the primary moisturizers. Though this is generally the case, it is not always. For example, the first three ingredients of a highly recommended body cream, CeraVe™ Moisturizing Cream, are: purified water, glycerin, ceteareth-20, and cetearyl alcohol. This product is not a cream in the above sense since oils and occlusives do not fall among the first four ingredients on the INCI. This is one example among many that demonstrate that just because a product is labelled a cream and is in a jar, it should not be assumed to be high in occlusive and emollients, and as described below, it is not necessarily more moisturizing. The INCI needs to be examined to gauge whether the product truly meets the need for which it is being recommended. Another general guide is that polymers, fragrances, preservatives, colorants, and dyes are often present at levels <1%. Since many functional ingredients are efficacious at levels >1%, if a product promotes an ingredient, a user may be well served by ensuring that the promoted ingredient is listed before these ingredients on the INCI. While this is a general rule, there are exceptions such as retinol, which is typically formulated at around 0.1%. In a standard moisturizer, one can find several classes of ingredients: moisturizing ingredients, emulsifiers, polymer/ thickeners, sensory modifiers, and preservatives. In addition to these ingredients, there are often advanced benefit ingredients as well, such as anti-oxidants, vitamins, lipids, or sunscreens. Below, we elaborate on these ingredients with details on usage levels and conditions required for efficacy and watch-outs. There are three key classes of moisturizing ingredients: humectants, occlusive, and emollients. Figure 2. 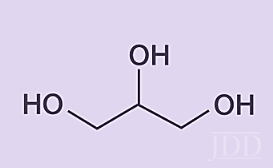 Chemical structure of glycerin (or glycerol). Hygroscopic conditioning agents containing multiple hydroxy (-OH) functionalities (Figure 2). By their chemical nature, they attract and bind water. They are water soluble, which means that while they are key moisturizing ingredients in leave-on formats, they are not easily retained on the skin from wash off products like cleansers. The most common humectant is glycerin. Occlusive ingredients in skin care products help regulate water in the stratum corneum by preventing excessive water loss from the surface of the skin to sustain a moisturized environment. They are by nature not 100% occlusive but allow for the transfer of water that is necessary for normal skin function.10A consequence of this increased water content is that it accelerates barrier recovery.10Most occlusives do not contain hydroxy functionalities in their chemical structure, so they cannot bind water. However, since they form uniform hydrophobic films, they effectively seal moisture into skin. The most common occlusive is petrolatum or petroleum jelly. Petrolatum is a highly refined blend of short and long-chain alkanes (Figure 3), microcrystalline wax, and mineral oils, and is a semi-solid at RT. When rubbed onto skin, petrolatum liquifies and penetrates the stratum corneum where it recrystallizes forming a strong interstitial occlusive system (not as superficial as is commonly thought). This substantially decreases transepidermal water loss.10At the same time, according to our testing on Vaseline jelly, petrolatum is non-comedogenic. Other occlusives include high molecular weight mineral oils and dimethicones (Figure 4). FIGURE 3. Chemical structure of a simple alkane chain. Higher alkanes, with 9 carbons or more, such as nonane shown here, are the basis of mineral oil. FIGURE 4. Chemical structure of a simple dimethicone showing the siloxane (-SiO-) backbone. Materials such as oils and lipids that are water insoluble but do not form an occlusive film. In some cases, the difference between an emollient and an occlusive is the molecular weight of the material. Examples of this are low molecular weight hydrocarbons and dimethicones that spread and absorb easily. They are often used for their ability to soften and smooth skin and impart a silky skin feel. Other classes of emollients include fatty alcohols and triglycerides, which are a key source of fatty acids for the skin. Examples of these include cetyl or cetearyl alcohol, cetylcaprylic/capric triglyceride. Also oils such as grapeseed, soybean, or sunflower seed oil (Figure 5). Sunflower seed oil (SSO) is a triglyceride precursor to alpha- linoleic acid, an essential fatty acid that is incorporated into stratum corneum ceramides. The type and level of emollient is determined by the consumer needs – the relevant benefit and the clinical need as well as the desired sensory. FIGURE 5. Chemical structure of an example triglyceride with 3 carbon chains attached to a glycerin backbone. The efficacy of a basic moisturizer is determined by the levels of humectants, occlusive, and emollients. A good moisturizer needs a balance of the three. High humectant lotions restore moisture levels to skin but cannot immediately decrease transepidermal water loss. High emollient or occlusive creams can immediately reduce TEWL but it takes some time for the skin hydration levels to be restored. It should, therefore, not be assumed that a cream containing high levels of occlusives or emollients is automatically more efficacious. A combination of these ingredients at adequate amounts is necessary to replenish moisture. Maintain it to create an environment where the skin barrier can be repaired. This combination can be designed in a cream or a lotion since the thickness can be manipulated independent of efficacy. One final point: glycerin, petroleum jelly, and dimethicone are amongst the most commonly used, safest, and most beneficial ingredients for the skin. 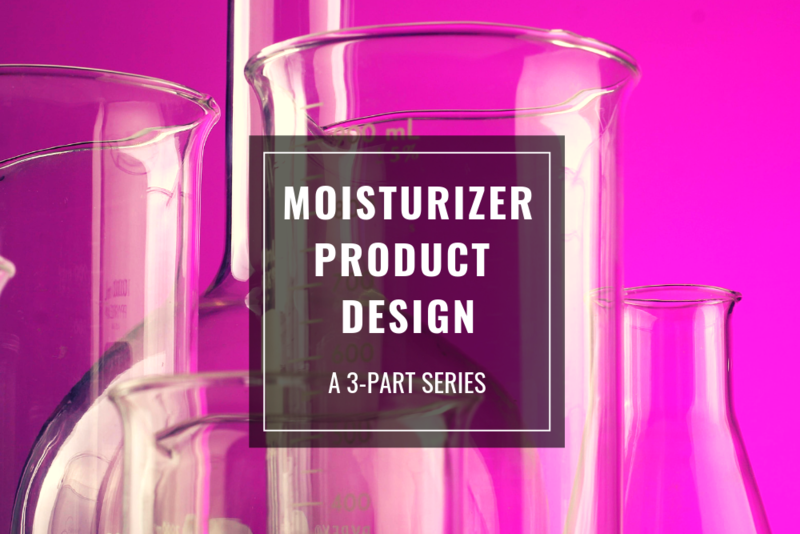 Stay tuned for part 2 of this series where Emulsifiers and Polymers, moisturization efficacy, and functional ingredients will be discussed. Lee, Christine, et al. “Principles of Moisturizer Product Design.” Journal of drugs in dermatology: JDD 18.1s (2019): s89-95. Content and images used with permission from the Journal of Drugs in Dermatology. Adapted from original article for length and style. Did you enjoy this article? Find more on Derm Topics here.